It is no secret that staying hydrated all day long is of the utmost importance. Nevertheless, it becomes even more critical when you are engaging in an intense activity like going on your MTB. But gaining access to your water can be a bit tricky if you are not using the best tools. However, using a water bottle cage remains to be the most convenient and practical one. For starters, you will not have to worry about the water getting in contact with your belongings if you keep it in your backpack. Moreover, you will get the chance to stay focused on the trail while getting the necessary nourishment. The market for water bottle cages is wide. In fact, you can find a lot of varieties and options that suit every need. In our mtb bottle cages review, we covered various products to help you pick the most suitable one. It is durable and it delivers what it promises. There is nothing else that you could possibly ask for. This water bottle holder will keep your water where you can reach it. You will not have to worry about tilting your arms in weird angles. Keep your hands on the handle bars while staying hydrated and nourished. What we love about this holder is that it fits most bikes and most water bottles too. It features an adjustable metal piece that you can easily adjust to fit different sizes of bottles with no problem whatsoever. It can even fit insulated bottles easily. In fact, you can install 2 of this holder for longer trips. It is made of one piece of flexible metal so it won’t break or fall into pieces. The aluminum alloy is very durable yet light. It won’t weigh you or slow you down when you are on the trail. It will last for long and will look great on your MTB. The powder finish matches with most bikes. The secure retention system will keep your bottles where they belong for as long as you want them. 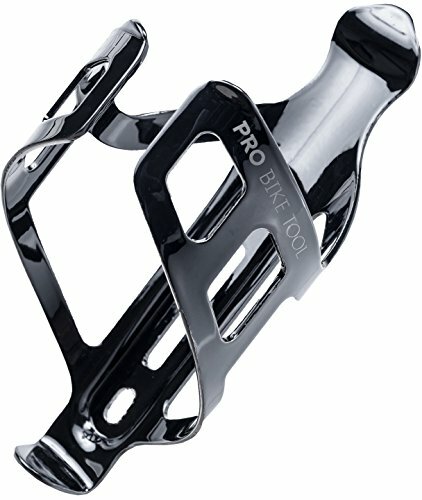 Fits most mountain bikes with no problem. Can be adjusted to suit different kinds and sizes of bottles. Secure retention system to keep your bottles secure. It needs special bolts to attach to frames. It sometimes stretches if you use it with bigger bottles. These water cages are very affordable. 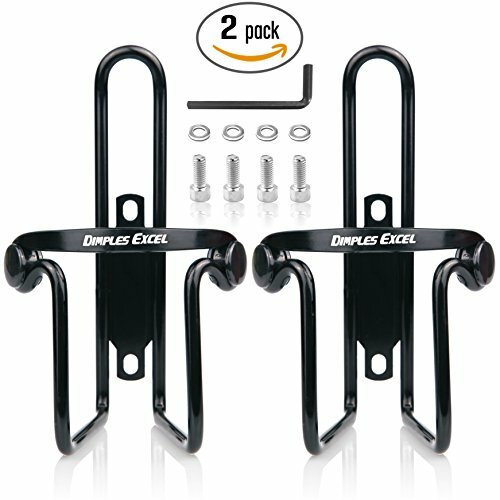 In fact, you will get a pack of two that you can easily install to your mountain bike frame. Use them both, or use only one of them and you will not have to worry about the extra weight. Each one of them weighs only 61 grams. This is almost undetectable when you are going on the trail. Each one of these bottle holders is made of high-quality heat treated aluminum alloy. 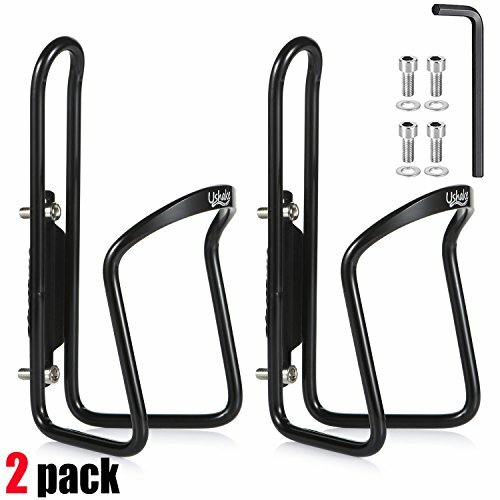 You can easily install and secure your bottle cage to your bike frame using the bolts that come with the package. The cage can fit bottles with a maximum diameter of 3 inches. Still the cage will hold your water bottle secure and you will not have to worry about your bottle falling off. The anodic oxidation keeps the holder black. It also maintains the status of your insulated water bottles. They will not scratch or fall off. What we love about this water bottle holder is that it is budget-friendly. Getting 2 for the price of one is definitely a bargain. Moreover, it will allow you to go on those longer trips without having to worry about running out of water. Affordable option to get 2 water bottle holders for the price of one. Heat treated aluminum alloy with elegant black coating. Fits most bottle sizes and can be easily adjusted. Comes with all the needed bolts. Can be too loose if your bottle is small. When you are looking for the Best Bike Water Bottle Holder you want something durable and practical. This amazing bottle cage lasts for long and will grant you easy access to your water all day long. In fact, thanks to the ovalized design, you will be able to get your bottle stable when you are in motion. The ribbed sides add that little strength you need when you are going on a rough trail. This way you will not have to worry about taking your eyes off the trail. The top part of the cage allows you to remove your bottle easily without getting distracted. This water bottle cage fits different sized bottles to suit all needs. It is lightweight so it won’t affect your speed on the trail. Moreover, it doesn’t take much to install. It comes with all the needed screws and bolts that will allow you to secure it to your bike frame. These water bottles come in several options. You can opt for buying a pair if you usually go on longer trips. You can also pick between 4 different colors to match with your MTB. Whatever you choose, you will end up with a high-quality water bottle cage that will last for long. Durable lightweight water bottle holder. Ovalized design to keep even smaller bottles in place. Ribbed sides to stabilize your bottle when going on rough trails. Easy access to your water when you are moving. This is not flexible enough. 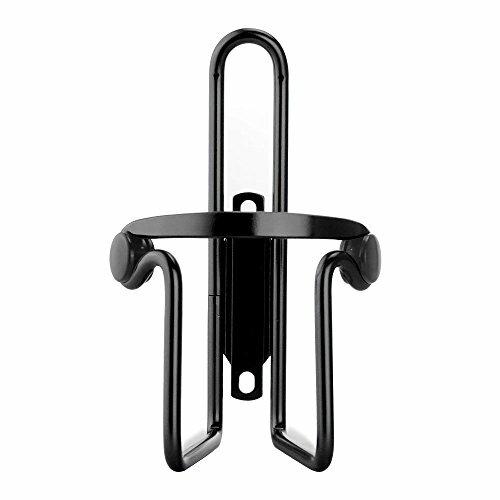 This is one of the best water bottle cages on the market because it is very well made. It is made of durable and sturdy aluminum alloy that will withstand the heat and the humidity. It is by far one of the most impressive extras that you can add to your mountain bike. It comes with 2 screws that will allow you to easily install it. It has arms that wrap around your water bottle for a snug fit. You will not have to worry about your bottle falling off as you experience bumps on the trail. In fact, it suits most water bottle sizes which is very convenient. It will not represent any extra weight that could slow you down. Moreover it comes in different colors that look elegant. Due to its design, you will be to access your bottle from different angles which is great news whether you are right or left handed. Access to water bottle from different angles. Arms wrap around the bottle to hold it in place. It doesn’t come with all the tools needed for installation. This is the perfect combo when you are exploring rough terrains. You get a water bottle and a special water bottle holder to keep you hydrated when you are on your bike. The bottle is BPA free and very healthy to use. It guarantees that you have access to clean water throughout your entire trip on the trail. It will stay in place when you are riding your mountain bike, so you will not have to worry about it getting lost. Moreover, it features a wide opening that will allow you to add ice if you want to. You will also be able to clean it thoroughly. The water bottle cage is a masterpiece. In addition to the fact that is costs practically nothing, it looks very elegant and sleek. You can easily attach it to your mountain bike frame for easy access to water no matter how long your trip is. It is made of high-quality aluminum that will not get affected by the heat or the rain. It is designed to last for long. 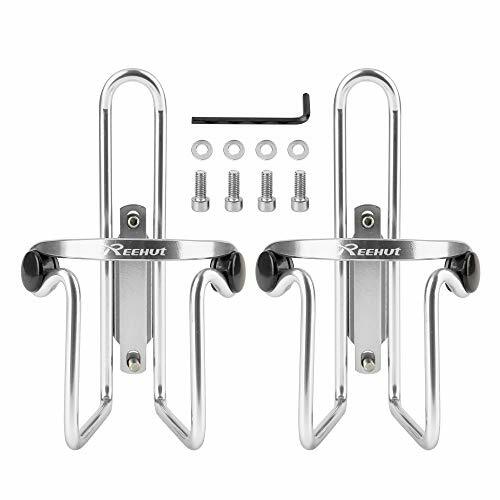 Moreover, it even comes with the needed metal pieces if your bike’s frame lacks the prefitted screws for holders. A combination of a BPA free bottle and water bottle holder. Securely attaches to your bike’s frame. Works with different kinds of bikes. Perfect combination between sturdiness and flexibility to keep your water in place. Water bottle cage seems to bend rather easily. What we specifically like about this water bottle cage is that you can install it to your MTB with no screws. It is the Best Water Bottle Cage if you want something hard because it is made of plastic. Just bend the valve and you will be good to go. It won’t rust or break and will keep your water bottle where you can easily reach it. The design is super convenient that you can easily attach in multiple positions. This will guarantee that you can keep your eyes on the trail and your hands where you can control your MTB properly. It also comes with an adjustable piece to fit different bike models. Moreover, you will be able to remove your holder fast when you are not using it. The design of this water bottle cage will keep your bottles secure. Your bottles will not fall off or move when you are speeding on the trail. It is also quite affordable and will last for long. Functional design providing easy access to water. Adjustable frame to work with different bikes. Can be installed in different positions. Easy to remove when not in use. Plastic can be too flimsy. The clips that hold bottles are not that flexible. This is the best mountain bike water bottle cage if don’t want to spend a fortune. It is one of the most affordable products on the market as you get two for the price of one. It comes with all the tools needed included the hex-key that will allow you to install it in no time. This wonderful water bottle cage fits most standard sized bottles. It is made of high-quality aluminum. It is durable and strong as it is designed to last for long. It will withstand the rough conditions off the road. You can expect it to stay in great conditions under the sun and the rain. What we particularly love about this water bottle holder is that it is very lightweight. Each one weighs 67.5 grams only. This means that you will not feel any extra weight dragging you down as increase your speed limit. This is extremely important for people who go on longer rides and would like to feel the thrill of speeding. You might have to bend it a little to fit larger bottles. But it would definitely look elegant and keep your MTB’s frame looking great. A package of high-quality aluminum water bottle cages. Comes with all the tools needed for easy installation. Suitable for longer trips as it won’t slow you down. Your bottle might move if you are going on a rough trail. Is not flexible enough to fit different sizes of bottles. 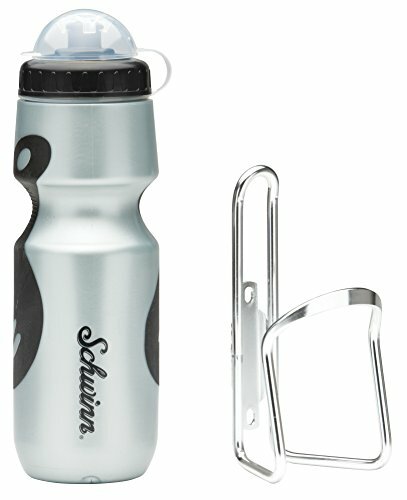 This water bottle holder comes with adjustable screws that are made of stainless steel. 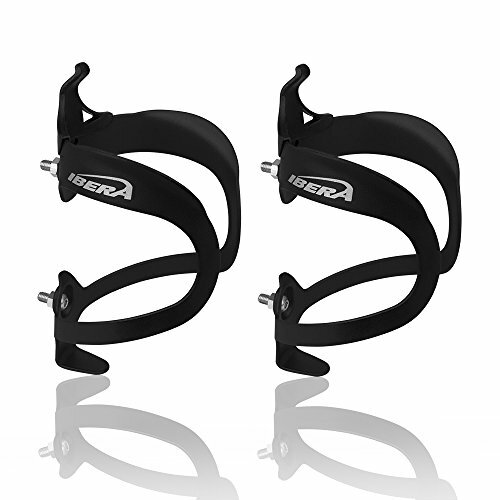 These will keep your cage in place even on rough trails. You will not have to worry about your cage moving or dropping your water bottle even when things get challenging. This water bottle holder is extremely light and weighs only 40 grams. Nevertheless, it is very durable and will last for long. It is made of excellent grade aluminum that will not break or scratch. This wonderful holder looks elegant and suits different MTBs. Moreover, it will allow you to stay focused on the road with easy access to drinking water throughout the entire trip. It will fit most standard bikes. Installing it is never a problem and will guarantee that you can access your water whenever you need to. You will not have to slow down while going on the trail or to dig through your backpack to take a sip of water. It comes in 4 different colors to suit all preferences and tastes. Extremely light yet durable water bottle holder. Made of durable aluminum with 2 stainless steel screws to keep it in place. Comes in 4 different colors to fit all preferences. Provides easy access to your water bottle. Tends to stretch over time. 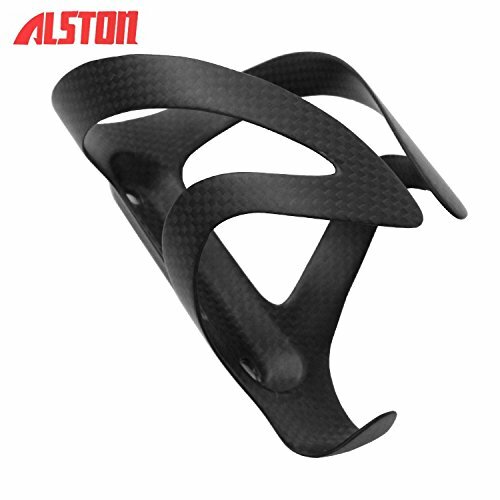 If you are looking for the best carbon water bottle cage, Alston Lightweight is the one you should pick. Carbon fiber is one of the most durable yet lightest materials. This water bottle cage will not break or bend with repeated use. It is built to last and to grant you easy access to your water bottle during your trip. Simply secure this holder to your mountain bike and you will never feel thirsty again. The most remarkable thing about this water bottle cage is that it weighs only 30 grams. This is almost half the weight of other models on the market. This is what makes it quite suitable for longer trips where you could certainly benefit from the lightweight accessory. It comes in 2 different finishes of black that will suit any bike frame. It will not rust, scratch or break as it is designed to handle a high level of abuse. You will not have to worry about it looking bad with time as it is guaranteed to be 100% non-corrosive. Although this water bottle cage costs more than other models on the market, it is definitely stronger and more durable. Sturdy carbon fiber water bottle cage. Long distance travelers need their water to stay healthy. At the same time, they definitely want to keep their MTBs light in order to experience the maximum speed. This is why adding accessories to your bike can be quite a dilemma. But this wonderful water bottle cage can be the solution. It is made of lightweight aluminum and weighs 100 grams. Still it is big enough to accommodate different types and sizes of water bottles. This water bottle cage comes in 5 shiny shades to add a glimpse of elegance to your bike with the needed hydration. 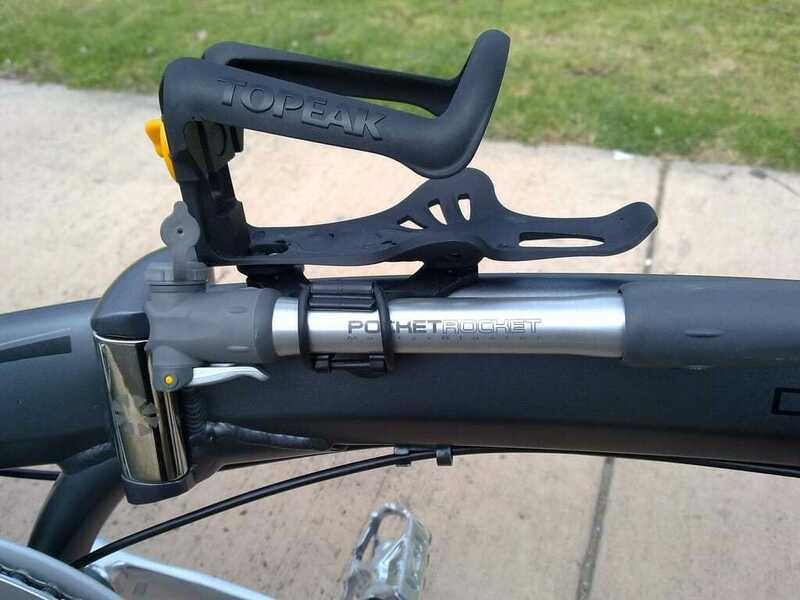 This water bottle holder is professionally made so that you can secure it perfectly to your MTB frame. It features a large diameter that you can easily adjust. It will work perfectly to hug bigger bottles snugly. You will not have to worry about your bottle moving or falling off. Moreover, you will be able to access your bottle from different angles. This means that your focus and concentration will be on the challenge ahead of you. It is the best solution to stay hydrated for the whole day. Lightweight aluminum water bottle cage. Big diameter to suit bigger water bottles. 5 elegant shades to match your preferences. Multiple angles to access your water bottle. Too big for smaller water bottles. Too many choices can be a little bit confusing. 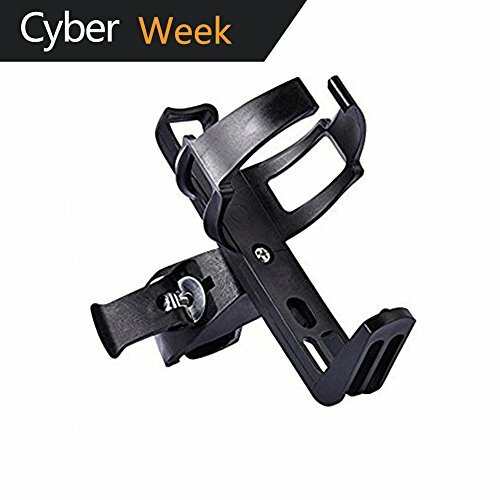 You want to make sure that you are buying the best water bottle holder for bike and not something that you will have to replace in a couple of weeks. Most mountain bike water bottle holders are made of sturdy materials. However, some of them will be more appropriate and durable than others. Aluminum is one of the most suitable options, but the cheaper models tend to stretch with repeated use. Once your water bottle holder stretches out, it will become useless. You can also opt for high-quality plastic if you want something that will not stretch out. However, it might break if your bottle is too big. Carbon fiber combines the best of both worlds but tends to cost much more. When you are adding accessories to your mountain bike, you want to make sure that you will not add any extra weight. Most models are light but you will have to weigh them against each other to pick the most suitable models. If you are planning on going on a long trip, you might need 2 water bottle holders. In that case, you will have to pick something that will not slow you down. This will be your chance to experience the maximum excitement. Flexibility is essential especially if you don’t carry the same water bottle all the time. It also matters if you tend to share your bike with other people. This will allow you to adjust the tightness of your holder to hold any bottle in place. However, too much flexibility is not a good thing. Your bottle might stretch over time. This will lead to your bottle falling off eventually as you hit a bump on the road. For this reason, the best models are the ones that feature screws to help you get the right tightness. These are by far more durable. Installing your water bottle holder shouldn’t be rocket science. Pick a model that comes with easy instructions and the needed tools. This will allow you to install your holder in no time. Make sure that your water bottle cage is secure before you take your bike to the trail. This will help you rest assured that nothing will go wrong when you are on your bike. 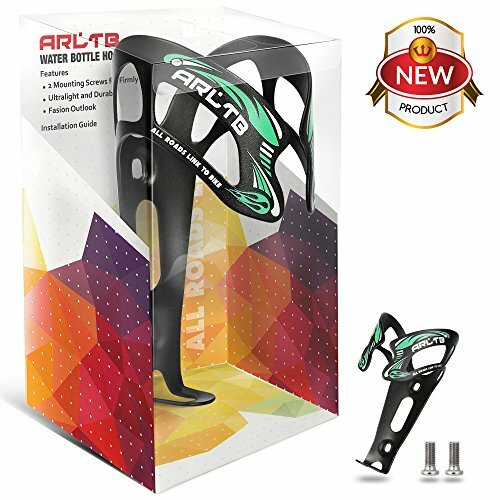 While some people think that finding the quality water bottle cage for mountain bike is not a huge issue, there are others who know better. You will not have to slow down or stop your mountain bike to have a sip of water. Moreover, you will not have to wait for the next stop to stay hydrated. This inexpensive accessory can actually help you go faster because you are well nourished and hydrated. All you have to do is to invest in a durable model that will not break or scratch. Make sure that it suits your water bottle for a fun experience on the roughest trails.